According to the copyright lawyers. Carol Danvers is the one legally recognized Captain Marvel, so who am I to argue? As usual, I’m going to start with an idea based on stand-up comedy. In Bob Newhart’s famous “Abe Lincoln Vs. Madison Avenue” he references The Hidden Persuaders. The point of the sketch was: if there were modern press agents and advertising during the Civil War, and there was no Abraham Lincoln, they would have had to create one. Similarly, the Marvel Cinematic Universe decided that they needed a high powered, patriotic garbed, female, focal point hero in their pantheon, with connections to the Avengers, outer space, and the Infinity Stones so they created one out of the character ingredients they had handy. 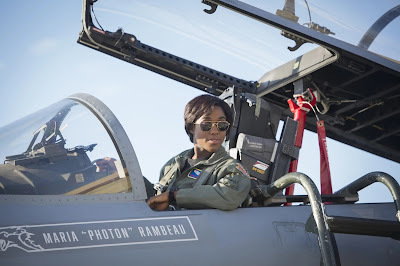 Ignoring the whole Shazam fiasco, there have been a string of various “Captain Marvel”s at Marvel Comics of varying race, gender and planet of origin. And frankly, that doesn’t matter at all. Comic books have lived by ret-cons for most of their existence, rewriting universes and their history to better fit within the storytelling needs of the time of their release. Similarly, the Marvel Cinematic Universe picks and chooses elements from the entire history of Marvel Comics to tell exciting and fun tales that appeal to all viewers, not just comic book geeks like me. 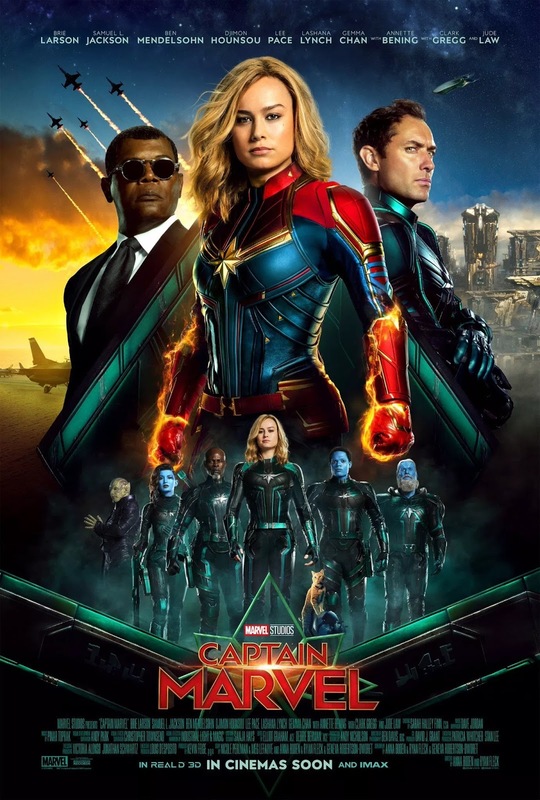 Captain Marvel is yet another fantastically successful storytelling endeavor, and fun movie. I’ve read reviews pointing out the only down side is the slow opening. This shows how jaded we’ve become as an audience for these things. The opening exposition included the reveal of yet another entirely new alien world including the sights, sounds, culture and military operations. But Marvel’s given us a whole swath of those already; therefore it’s become business as usual. The de-aging CGI is staggering, young Nick Fury and Phil Coulson don’t stand out at all compared to the rest of the cast. Young actors may be in big trouble now that studios can easily combine youthful looks with the experience and skill that comes with age. Like the really good retcons in the comic book medium these films come from, the connections to what has gone before in terms of artifacts, alien races and characters are seamless. But there are enough twists and turns toward and away from the expectations of previous movies, and comic book stories to keep the story exciting and unexpected as it flies along. Speaking of flying along, Brie Larson joins an elite group. Her discovery of flight moment carried the same enthusiastic realism and believability that I’ve only seen twice before. The Christopher Reeve Superman and Robert Downey Jr. in the original Iron Man. That’s some seriously high level superhero company there. She wears the mantle well and I’m greatly looking forward to seeing her in crossover films and solo adventures. Captain Marvel will fit in amazingly well with any of the other Marvel characters, and hold her own. She’s tough and serious when needed, and can be downright terrifying. But she can also snark and smirk with the best of them. (Nick Fury being one of the “best of them” including my favorite moment, his musical reason that Marvel sounds cooler.) More importantly, for a superhero, she was shown bonding strongly to and acting as a fantastic role model for kids. It gets harder and harder to review the Marvel Franchise, because it’s all so good. We cheered, we laughed, and we gasped. I don’t want to spoil anything, which means all I can say about the Kree and the Skrulls were, they were scary and sympathetic, and sweet and terrifying. In summary, much happened that was unexpected. I may have yelled out an expletive or two involving some of the larger surprises concerning household pets and traditional stand offs. Captain Marvel is another fantastic piece of the ever growing puzzle Marvel is building. It was set in the past, giving us more explanations for the universe we know. And it gets some amazing bonus points for having excellent music that was still true to the 1990’s period it was set in. However, it also set us up for the future, both by making Carol Danvers a character whose powers and personality can lead the Avengers or whatever comes next, and by leaving threads of other stories and characters to come. One thing comic books don’t have to deal with is the effect of the real passage of time on its characters, only its readers. By bringing in new talent of this caliber and retooling their vast array of available characters, the Marvel Cinematic Universe can continue forward without having to reboot or recast every couple of years, and still focus on the audience’s needs. One final note from this Silver/ Bronze Age DC comics fan. After Ryan Reynolds basically playing Kyle Rayner, it was very cool to get what was a classic era, honest and fearless test pilot, becoming the best of the best of an energy powered space police force, right down the brown bomber jacket.